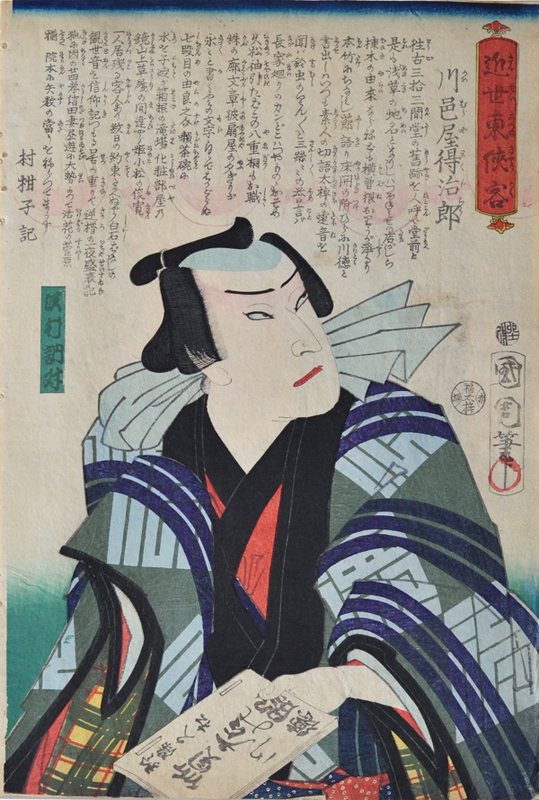 Toyohara Kunichika (1835-1900) Heroic Commoners of Modern Edo (Kinsei Azuma Kyokaku) 1863. Series of Five Oban Prints. Click here to view Sheet 1. Click here to view Sheet 2. Click here to view Sheet 3. Click here to view Sheet 4. Click here to view Sheet 5. 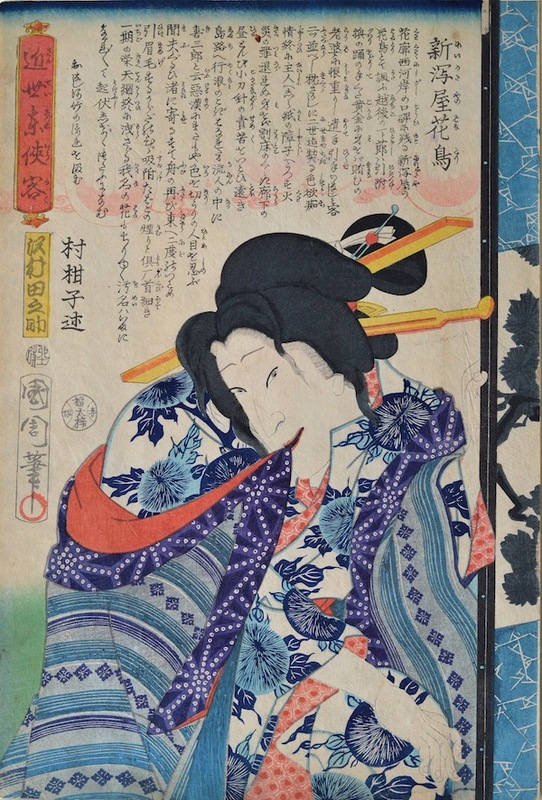 A rare opportunity to acquire a set of five early woodblock prints by Kunichika. This small series is a set of portraits of leading actors of the day playing the parts of ‘commoners’. 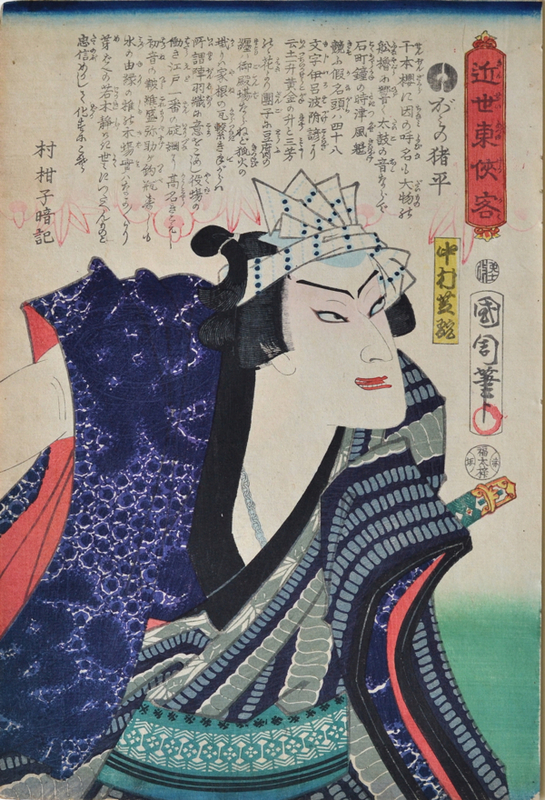 The description is very important in understanding the role that kabuki played in the social and political life of late Edo. These particular performances - stories of ordinary people - were effectively a challenge to the waning supremacy of the old feudal system. 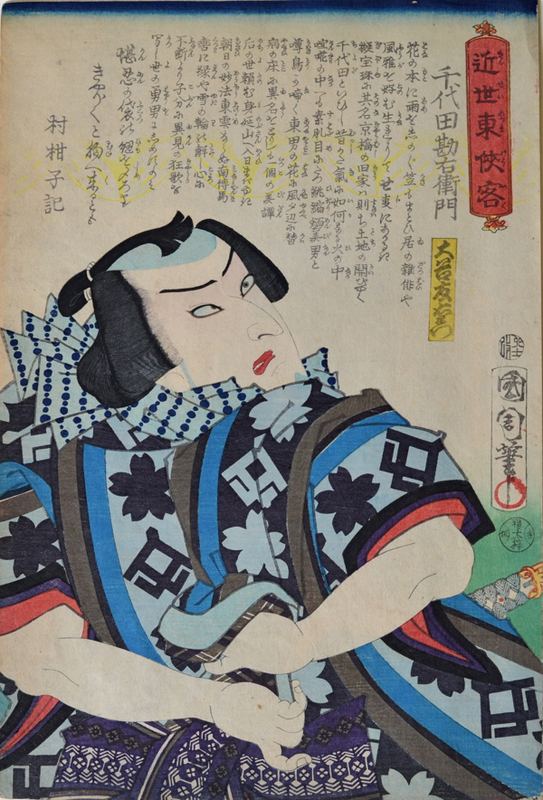 Kabuki was an outlet for dissenting and discomfited townspeople who were well aware of their contribution to the economy but were taxed and legislated against by an increasingly bankrupt ruling class - the samurai. This critique was quite explicit, hence the more or less continuous harassment of theatres, actors, printmakers, publishers and performances by the authorities. Tellingly, this series dates from only a year before the commencement of the revolution that would finally unseat the Shogunate and install a benevolent monarchy designed along European lines, committed to change and modernisation. 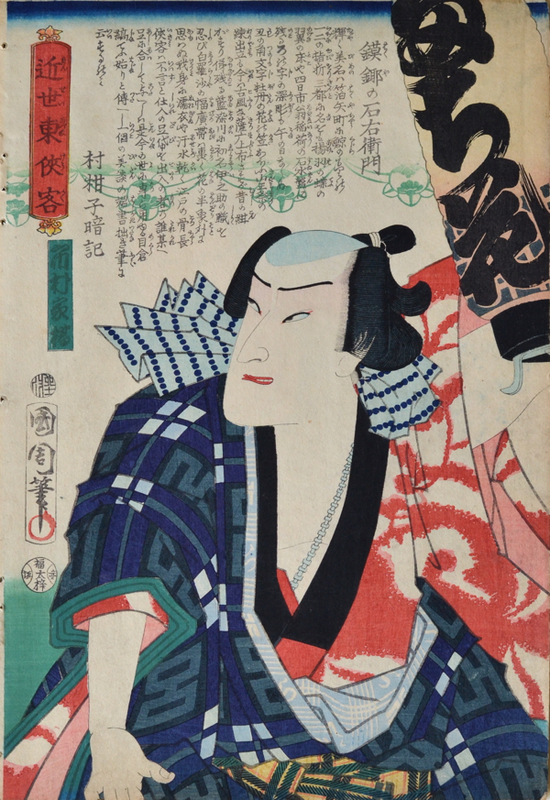 The five actors are, from left to right, Nakamura Shikan, Sawamura Tanosuke, Otani Tomoemon, Ichimura Kakitsu IV and Sawamura Tossho II. This is a very fine set, not widely known in its entirety and in fine condition. The set is beautifully printed with delicate bokashi shaded backgrounds and discreet embossing to the vestigial crests and other details. The colour is strong and the drawing very sophisticated. The sheets have been stored in album form from the nineteenth century and they have binding holes to the left hand edge. Each sheet 36 x 25 cm.